The Globe Theatre Layout is housed in an open arena. Not one inside picture of the old Globe is in existence, however, a picture of another Elizabethan theatre, the Swan, has survived. The following picture of the Swan theatre by Johannes de Witt, a Dutch traveller, is dated between 1596-1598. The layout of the open air arena, featured the 'pit' or the 'yard'. The Globe had a raised stage at one end and was surrounded by three tiers of roofed galleries with balconies overlooking the back of the stage. The stage projected halfway into the 'pit'. 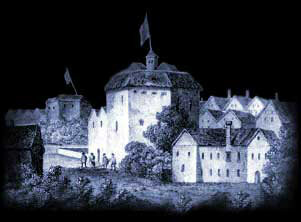 Shape of the building - It had been assumed that the Globe Theatre had been an octagonal shaped building. This assumption was based on the illustrated Visscher map engraving of 1616. But recent archaeological evidence and other documents, such as the illustrated Hollar map, indicate that it was actually a 20-sided building. Interesting Facts and information about the Globe Theatre Layout. Additional details, facts and information about the Globe Theatre can be accessed via the Globe Theatre Sitemap.